Natural Citrus™ SMOOTH uses the power of all natural orange peel extracts to lift and remove the most stubborn dirt and grease. This premium formula contains special detergents designed for gentle yet effective cleaning of dirty hands when ordinary soaps won't work. It even cleans without using water. 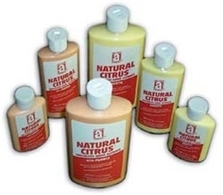 Natural Citrus is fortified with lanolin and other special emollients to prevent dryness and to keep hands soft and comfortable. Natural Citrus with PUMICE adds mild grit to the same formula to gently deep clean the toughest dirt.